When it comes to food, I'm a sucker for inspiration. I've gone on shopping sprees based on episodes of Top Chef or a page out of the dearly departed Gourmet. So when I heard last week's Splendid Table, I keyed in on the idea of cauliflower, a vegetable with a wonderful wintery quality. But despite the promises of Lynne Rossetto Kasper and Momofuku's David Chang, I didn't think the crispy rice and fish sauce vinaigrette would sell with my fiance, who is a bit picky about his food and was somewhat skeptical of cauliflower in the first place. Instead, I took inspiration from my inspiration and decided to merely roast the cauliflower with a mix of key lime oil and olive oil, salt, pepper and some red curry powder (just the boring Spice Islands kind -- when the fiance and I merged our kitchens, we ended up with approximately 87 million spice jars, and have been trying to find ways to use them up). To roast the cauliflower: Heat the oven to 400°F. Put the florets in a large mixing bowl, add a splash of oil—enough to coat them, start with a couple tablespoons—and toss. Spread the cauliflower out on a rimmed baking sheet (or two—you want space around the cauliflower so it roasts, not steams) and pop into the oven. After 20 to 25 minutes, the cauliflower should be browned in spots and tender. I say they forgot something: Turn the cauliflower about halfway through. I ended up with cauliflower that wasn't just brown in spots, it was dark brown and crispy in a few places and seasoned-white everywhere else. Which created a discontinuity in texture that ultimately wasn't as pleasing as I had hoped. I believe turning the cauliflower would have mitigated that, and will try turning the next time I decide to roast it. To accompany the cauliflower (which, though a side, was the main experiment of this plate), I put a large pan on medium high heat. In it I put olive oil, green peppercorns, yellow curry powder, a little powdered red pepper, and salt and pepper. I added sliced yellow fingerling potatoes, and once they were about half done, several chicken tenders. When the chicken and potatoes were done (the potatoes got a nice sear), I removed them, leaving the oil, spices and peppercorns in the pan. I added a little heavy cream and white wine, resulting in about a cup, maybe cup and a half, of sauce. I also made some garlic bread, melting butter and olive oil with tons of pressed garlic and salt and pepper, then smeared that on slices of fresh olive oil-rosemary bread. That went in the oven (with the cauliflower) throughout the potato/chicken process. I didn't think to take a picture of the plate -- which is OK, since it was pretty blandly colored, between the garlic bread, cauliflower, chicken, potatoes and basically beige sauce. 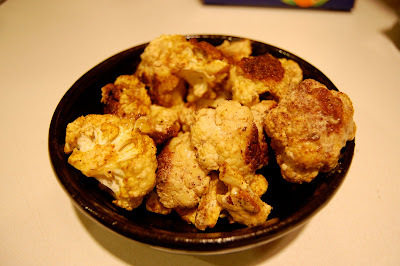 But at the top of the page is a picture of the cauliflower, with some sauce on: You can clearly see the brown spots. I think Cook's Illustrated did an article on roasting cauliflower a while ago, and they cut it into huge, thin wedges. Perhaps flatter pieces would mitigate the browning issue? hmm, that's a good idea -- if you turned it evenly, each of the two giant flat sides would be equally browned.